Guaranteed Application Finance Monthly Price Example - APPLY THROUGH OUR WEBSITE! We have a huge range of stock available including all makes and models, even if you don't see what you are looking for on our website, if you are happy with our finance packages we will Source a Car for you! Credit Rebuilding Plans Low Weekly Prices No Deposit Finance Prices from as Little as £100 a month!! Low Mileage, Great Condition Examples Other Cars available Benefits Accepted www.WeFinanceAnyone.co.uk Any situation considered, we look at your future. Accepts on affordability rather than credit history. Even if you have been rejected before we can help. Massive range of vehicles, any makes and models. UP to 12 Months MOT 12 Months AA Breakdown Cover Parts and Labour Warranty Included 5 Days Driveaway Insurance from £2.50 per day Part Exchange Why Deal With Anybody Else? *Every effort has been taken to provide accurate finance examples however figures may differ, to those shown. We have over 5 examples of this car in stock now, please call for details! As a responsible dealer and finance broker we are committed to applying the FCA's principles of Treating Customers Fairly throughout our business at all times. For more information please visit our website. 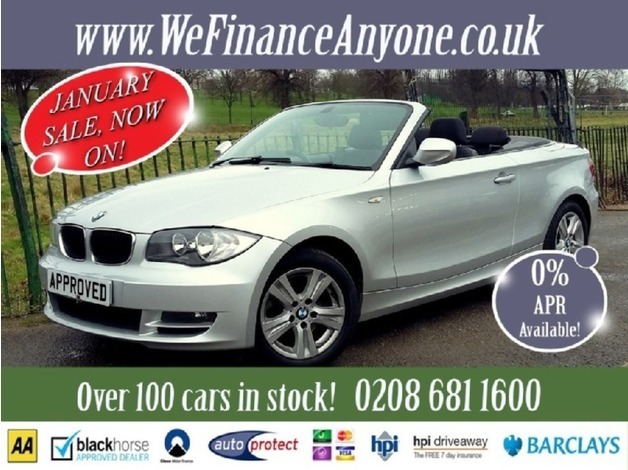 www.WeFinanceAnyone.co.uk 0208 681 1600. BMW. 1 Series. Diesel. Convertible. 2.0cc. Manual. Aluminium Silver.